Just this month, the World Health Organization recommended that adults and children eat less than 25 grams of sugar daily. 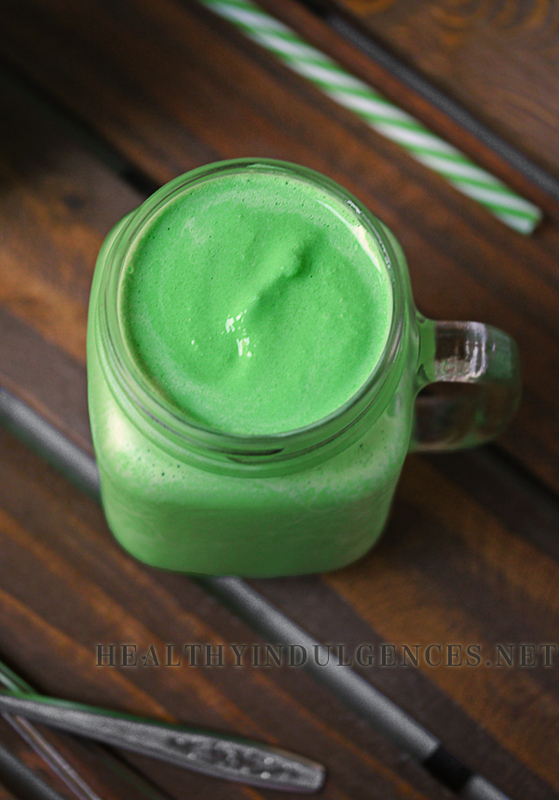 A small (12 oz) McDonald’s Shamrock Shake contains roughly 3 times that amount! That’s a problem. Even as a once-in-awhile treat, you’d have to do back-to-back Zumba classes to burn off all of that sugar! After sweatin’ buckets in Zumba this week, I can verify that it would be no easy task. VANILLA REDUCED FAT ICE CREAM Allergens: MILK Ingredients: Milk, Sugar, Cream, Nonfat Milk Solids, Corn Syrup Solids, Mono- and Diglycerides, Guar Gum, Dextrose, Sodium Citrate, Artificial Vanilla Flavor, Sodium Phosphate, Carrageenan, Disodium Phosphate, Cellulose Gum, Vitamin A Palmitate. 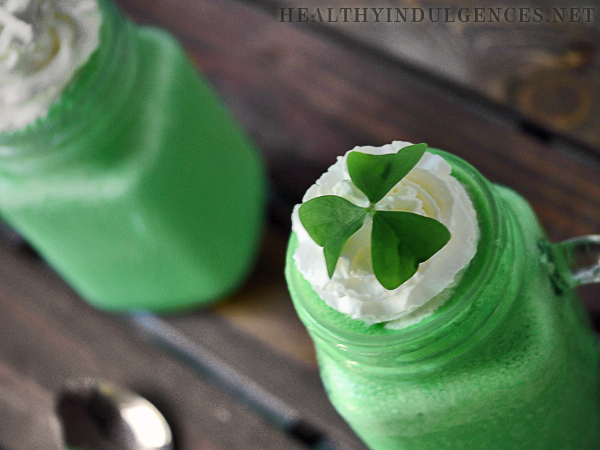 SHAMROCK SHAKE SYRUP Ingredients: High Fructose Corn Syrup, Corn Syrup, Water, Sugar, Natural Flavor (Plant Source), Xanthan Gum, Citric Acid, Sodium Benzoate (Preservative), Yellow 5, Blue 1. May contain small amounts of other shake flavors served at the restaurant, including egg ingredients when Egg Nog Shakes are available. Now, I’m no a food perfectionist, but I do try to avoid processed junk when possible. Why ingest preservatives and thickeners if they can easily be avoided? A recent study involving a couple of common food additives revealed that our gut bacteria might be adversely affected by them, so I’m looking even more closely at labels now. Fresh ricotta cheese takes the place of corn syrup-filled ice cream in this thick, decadent shake. It might sound strange to have cheese in a milkshake, but ricotta is very neutral-tasting. It blends into the shake smoothly, with no discernible taste and texture. Calabro brand ricotta has no funky additives, so I recommend tracking it down if it’s available in your area. I ended up using Target brand ricotta for the photoshoot, and it tasted great. It does contain gum thickeners, so be aware of that if you’re sensitive. Don’t skip on adding the egg yolks! They’re the secret ingredient that makes the shake ultra creamy. Because there’s a small risk (0.003%, to be exact) of bacterial contamination from consuming uncooked eggs, I recommend purchasing pasteurized eggs. Davidson’s Safest Choice brand is the one I’m most familiar with. You can search grocery stores in your area using the locator on their website. Alternatively, you can pasteurize your eggs at home by submerging them in water heated to 140 degrees Fahrenheit for a few minutes. That being said, I have been eating raw eggs daily for 6 years (mostly conventional and unpasteurized) and haven’t had a problem yet. The fresh spinach is added purely for a splash of color and antioxidants. 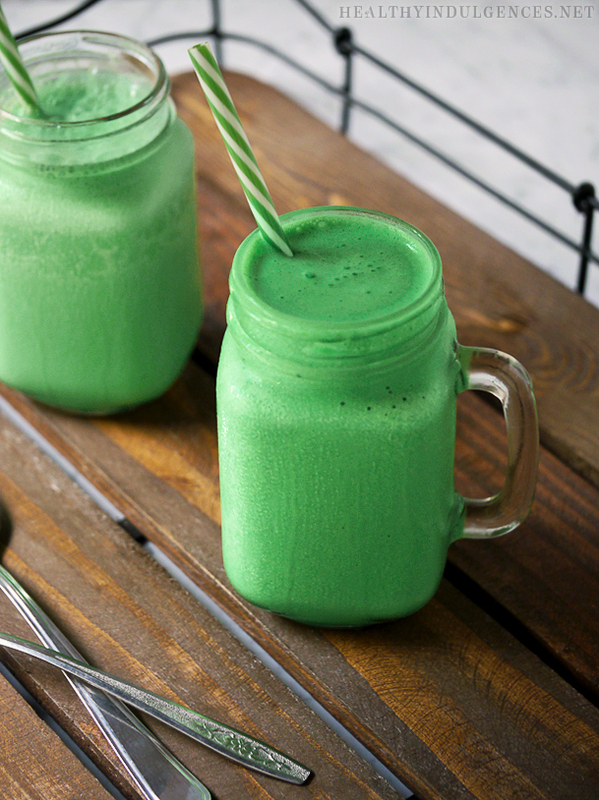 You can leave it out if you like, but I pinky promise you won’t be able to taste any spinach-y grassiness in the shake. The flavor is completely overpowered by the peppermint extract. The shakes in the photos, admittedly, had a little more help in the wardrobe department than the spinach could offer. What can I say? I’m Irish! 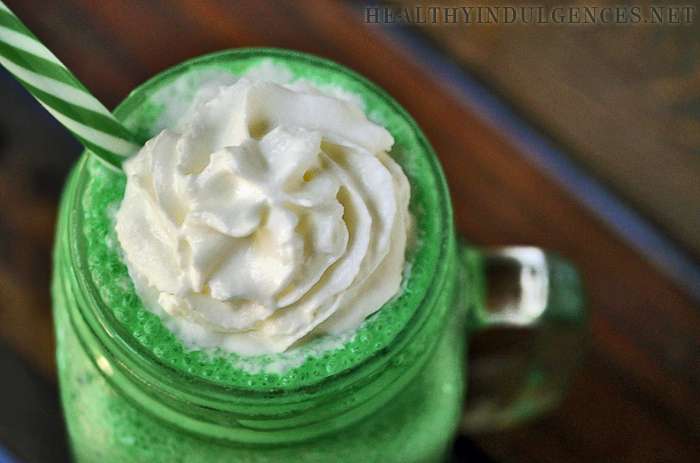 It wouldn’t be St. Patty’s day without festive, clover-hued beverages. Bottoms up! 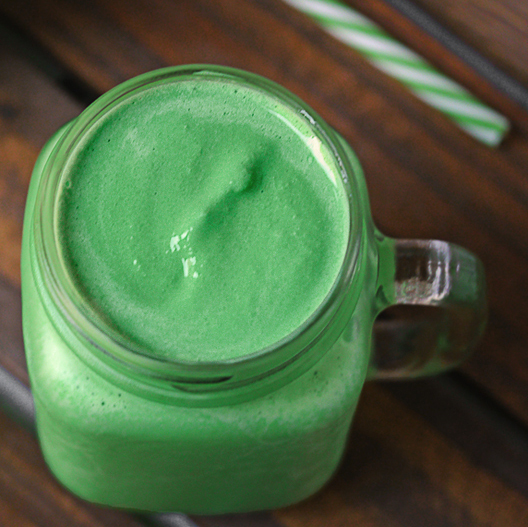 More of a meal than a shake, this decadent yet nourishing version of the fast food giant’s seasonal treat is packed with protein and good fats that will keep you going all day long! I use natural sugar-free sweeteners, but you can feel free to substitute with whatever sweetener you prefer. Add all ingredients, excluding ice, to a high speed blender. Retrieve crushed ice from the freezer last. Add ice, and blend till smooth. Top with whipped cream if desired. Line a cookie sheet (narrow enough to fit in your freezer) with aluminum foil. Pour mixture on to cookie sheet. Freeze for 2 hours, or until solid. Remove cookie sheet from freezer and peel off chunks of frozen shake mix. Add frozen chunks to food processor and process till creamy. *In place of the sweetener blend, you can use 2 Tablespoons erythritol + 1/4 teaspoon stevia. If you don’t have access to these sweeteners, Splenda would work, but you’d need to add the carbohydrates to the carb count. 420 Calories; 33g Fat (71.9% calories from fat); 22g Protein; 8g Carbohydrate; trace Dietary Fiber; 510mg Cholesterol; 152mg Sodium. wow!!! what a milkshake man! i tried it at home and i just loved it, seriously. Hello nice recipe of milkshake i did impress my all guest who came to my house yesterday i am very thankful to you. This is very Good Recipe. There are lots of persons who face Loss of hunger problem. I suggest them to use Homeopathic remedies to Cure first before using these recipes. Nice recipe. There are lots of persons who face Loss of hunger problem. I suggest them to use Homeopathic remedies to Cure first before using these recipes.